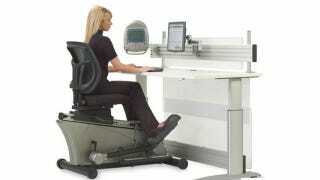 The Elliptical Machine Office Desk: Out, Work Workout! It's a desk chair! It's an elliptical machine! It's an embarrassment! Ye gods, Hammacher Schlemmer, what have you unleashed this time? And who on earth is going to pony up $8,000 for it? The latest contraption from the famed automated hammocks and sundries company combines a semi-recumbent elliptical chair and an desk of adjustable height, allowing you to pedal the calories away while collating those spreadsheets, or whatever it is people who are rich enough to afford one of these does during the day. It's safe for use if you're between 5' 2" to 6' 9" and under 300 pounds, meaning the heavies most in need of low stakes midday cardio need not apply.